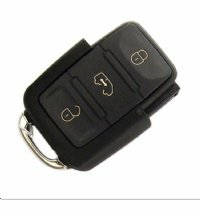 VW Crafter 2006-2016 3 ButtonRemote OEM. No logo as will be on the key part. OEM VAG 3 Button Flip Head Remote. Lock, Unlock and rear door Button. No key blade supplied but would be HU64 . This is just the remote. You will need a HORSESHOE AND BLADE.